Today in Masonic History Albert Alonzo "Doc" Ames is born in 1842. Albert Alonzo "Doc" Ames was an American medical doctor and politician. Ames was born on January 18th, 1842 in Garden Prairie, Illinois. At the age of 10 his family moved to the Minnesota Territory. There he attended local schools that were run by the federal government. In 1857, while still in High School, Ames became a "printer's devil", an apprentice in a print shop who is tasked with a variety of jobs. A year later he graduated from High School and then studied medicine. Most of medical education came form assisting and watching his father, who was a physician. He did also attend Rush Medical College in Chicago, Illinois. He graduated with his M.D. in 1862. After Ames graduated from college, the Civil War broke out. There were also, at the time, tensions with the Dakota People. Because of these two events, Ames enlisted in the Minnesota militia. 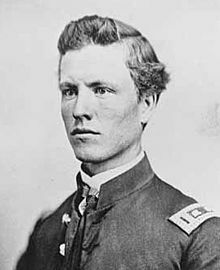 He served in the western theatre of the Civil War and would eventually be promoted to the rank of surgeon major, before leaving the service in 1865. In 1866, Ames, who was popular with veterans, was elected to the Minnesota House of Representatives on what is called a "soldier's ticket" for a single term. After the his term in the House, Ames headed west to live in California. Once in California he went into the newspaper business, before returning home in 1874, when his father passed away. Once back in Minnesota, Ames took over his father's practice. He was loved by his patients and was a pillar of the community. He would often treat the poor for free and would never refuse a request for a house call. When a tornado destroyed, St. Cloud and Sauk Rapids, Ames was on the scene to treat the injured. From this event, Ames gained national attention. In 1875, Ames entered the political arena. He served on the Minneapolis City Council. He was elected Mayor three times in the 1800's. His first term was described as indifferent. His second and third saw accusations of corruption. It was around this time that he also fought to get a Veteran's Home created in Minneapolis. When he was defeated by a Republican, they took seriously Ames suggestion for a Veteran's Home and made it a reality. He would later serve as a surgeon at the home. On the National Stage, Ames ran unsuccessfully for the United States House of Representatives. He was also considered as a candidate for the Vice Presidency. In 1900, Ames life turned a corner. In at least one article he was described as a Dr. Jekyll and Mr. Hyde. In the 1900 primary for Mayor, Ames could see no way to victory as a Democratic Candidate. He asked people to write him in as a Republican, which got him on to the ballot for Mayor. He would go on to win the election and begin serving as Mayor a fourth time in 1901. Ames replaced various city officials with his own political allies. He mad his brother the Chief of Police and the two began treating them Minneapolis Police force as their own personal army. The police would be sent out to shake down criminal organizations for money. This all occurred with the knowledge of the people of Minneapolis, it was, essentially a public secret. In 1902, a local businessman, Hovey C. Clarke, took charge of the grand jury. He dismissed the county prosecutor who refused to go after Ames and his brother. Clarke hired private investigators to gather evidence on Ames, his brother, and people who were described as his henchmen. Ames left Minneapolis, presumably to avoid being arrested. He was eventually taken into custody in New Hampshire, before being extradited to Minnesota. Initially he was convicted, although it was overturned by the Minnesota Supreme Court on a technicality. He was never tried again. Ames passed away suddenly on November 16th, 1911. Ames was a member of Hennepin Lodge No. 4 Minneapolis, Minnesota. He served as Worshipful Master of his lodge. According to his obituary he was a 33° Scottish Rite Mason and a York Rite Mason.